The Second Edition of Life On A Line is now available for download in Adobe PDF format. You can purchase a copy right now using PayPal or any major credit card, for only $14.95 US, and you can be reading it within minutes! Underground rescue from caves and mines is the most extreme form of technical rescue in the world, demanding the highest levels of skill in caving, structural engineering, excavation, geology, trauma medicine and of course ropework. 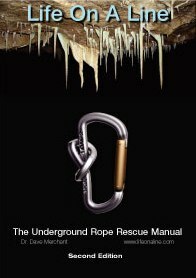 Life On A Line is the only specialist rope rescue book written for cave rescuers and the First Edition has become the standard text for hundreds of rescue teams, both underground and surface, across the world. LOAL Second Edition is a completely new book, containing over 200 pages full of expanded information and updated techniques for all aspects of ropework, from equipment selection and basic rigging to the complex mathematics of friction and traverses. Entirely new chapters cover casualty care and stretchers, animal rescue and expedition rescue, plus in-depth explanations of the standards and legal frameworks affecting today's teams. It remains an international textbook, with techniques and explanations aimed at both European EN/CE, American ASTM/NFPA and international ISO/UIAA standards. We concentrate on adaptable and proven techniques that can be applied by teams using their existing equipment, and also review the very latest developments from manufacturers across the world. LOAL1 was good so I expect this one will be just as good! Thanks for the plug Evan. It took long enough to finish that most of you probably gave up waiting and asked your kids to check for a copy when they grew up. There should be a paperback version in the US distribution channels in a week or three, but of course the download is going to be cheaper by a mile. Still, people keep asking for it so we'll see how it goes! Can you give us a shout when this is available? I have a hankering for a bound version that I don't have to punch holes in myself. Yesterday I used my PayPal account to purchase the online eBook. Spent a few hours last night, after the grotto meeting.Good book! I'm waiting for the Mrs. to get a replacement black ink cartridge, then will start printing off my paper copy in bits. I just purchased my copy and I'm looking forward to checking out the book. I REALLY enjoyed the first edition. If you're into rigging and rescue, this book is a must have.